Exploring the Adriatic Coast by luxury yacht is a challenging task: it's a sizeable sea — with too much to see and do for one luxury yacht charter or private yacht vacation alone. This itinerary gives an idea of the treasures ready to be discovered — in order to cover the distance involved this would almost certainly involve steaming overnight to make the most of the destinations by day. Day 1: Venice: Fabled ‘floating’ city There’s an abundance of things to see and do in this unique city — many of which revolve around life on board your superyacht. Venice is popular with superyachts and a very pedestrian city — the absence of cars makes it a delightful place to explore on foot (apart from high summer when it can be very humid and buzzing with tourists.) There are churches, museums, exhibitions, and galleries galore. The shopping is wonderful and the lack of extensive nightlife may be a good thing – there’s far too much to see by day to waste it sleeping off the night before! Take local advice to discover the best restaurants — it’s accepted that the quality of food here is not what one would except in Italy and according to many, apparently the worst pizzas are found in Venice. Look for Veneto specialities that use cuttlefish and its black ink, or even better — make use of your superyacht chef and dine on board your luxury yacht. In July and August the city is crammed with tourists. At the end of the summer the city hosts the Venice Film Festival — one of the highlights of the Mediterranean season. If you are interested in visiting don't miss our guide on how to survive the film festival by yacht. Exploring the Adriatic Coast by luxury yacht is a challenging task: it's a sizeable sea — with too much to see and do for one luxury yacht charter or private yacht vacation alone. This itinerary gives an idea of the treasures ready to be discovered — in order to cover the distance involved this would almost certainly involve steaming overnight to make the most of the destinations by day. There’s an abundance of things to see and do in this unique city — many of which revolve around life on board your superyacht. Venice is popular with superyachts and a very pedestrian city — the absence of cars makes it a delightful place to explore on foot (apart from high summer when it can be very humid and buzzing with tourists.) There are churches, museums, exhibitions, and galleries galore. The shopping is wonderful and the lack of extensive nightlife may be a good thing – there’s far too much to see by day to waste it sleeping off the night before! Take local advice to discover the best restaurants — it’s accepted that the quality of food here is not what one would except in Italy and according to many, apparently the worst pizzas are found in Venice. Look for Veneto specialities that use cuttlefish and its black ink, or even better — make use of your superyacht chef and dine on board your luxury yacht. In July and August the city is crammed with tourists. At the end of the summer the city hosts the Venice Film Festival — one of the highlights of the Mediterranean season. If you are interested in visiting don't miss our guide on how to survive the film festival by yacht. 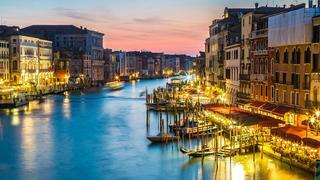 Bid farewell to Venice as you re-enter the Adriatic and make for Trieste. 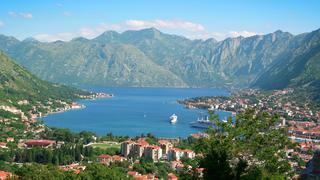 This city is right up in the northernmost head of the Adriatic, close to the Slovenian border. Trieste is a very safe city – you can stroll here at night and explore the old town without worrying about the safety of your part, As Trieste is a border town on the crossroads of the Latin, Germanic and Slavic worlds, it is quadrilingual: the official languages are Italian, Slovenian, Ladin and German. The architecture also reflects the many cultural influences; there are some good Roman remains, fine Austrian empire buildings of the type you’d find in Vienna alongside Mediterranean styles. There are several museums and interesting churches and castles as well as coastal walks with wonderful views. Save time to visit Muggia and the Porto San Rocco Marina on the opposite side of the bay, which can host yachts up to 60 metres. The cuisine here has also melded the flavours of the Germanic and Slavic tastes with Italian food. Try the gnocchi, in the style of Austrian dumplings and head to a pastry shop to pick up some torte or strucolo de pomi –a variation on the strudel. Other local delicacies include fish soups and risotto. 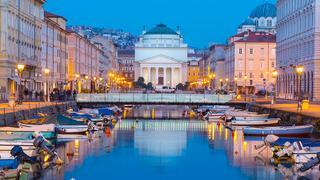 As Trieste is a border town on the crossroads of the Latin, Germanic and Slavic worlds, it is quadrilingual: the official languages are Italian, Slovenian, Ladin and German. The architecture also reflects the many cultural influences; there are some good Roman remains, fine Austrian empire buildings of the type you’d find in Vienna alongside Mediterranean styles. There are several museums and interesting churches and castles as well as coastal walks with wonderful views. Save time to visit Muggia and the Porto San Rocco Marina on the opposite side of the bay, which can host yachts up to 60 metres. The cuisine here has also melded the flavours of the Germanic and Slavic tastes with Italian food. Try the gnocchi, in the style of Austrian dumplings and head to a pastry shop to pick up some torte or strucolo de pomi –a variation on the strudel. Other local delicacies include fish soups and risotto. Leave Italy and pass the coast of Slovenia en route to Pula in Croatia. 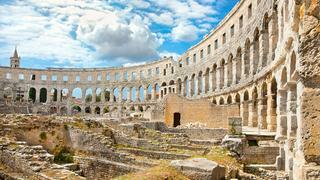 Take in the atmosphere around Pula’s remarkable Roman amphitheatre — just one " must to" activity while visiting Croatia on a luxury yacht. If it’s film festival time you can catch an open-air screening inside the arena. Dine in style at Valsabbion and savour innovative cuisine using the best of the region’s produce. After dinner, you can rejuvenate and enjoy the view from Valsabbion’s top floor spa before heading back to your luxury yacht. Leave Italy and pass the coast of Slovenia en route to Pula in Croatia. Take in the atmosphere around Pula’s remarkable Roman amphitheatre — just one " must to" activity while visiting Croatia on a luxury yacht. If it’s film festival time you can catch an open-air screening inside the arena. Dine in style at Valsabbion and savour innovative cuisine using the best of the region’s produce. After dinner, you can rejuvenate and enjoy the view from Valsabbion’s top floor spa before heading back to your luxury yacht. 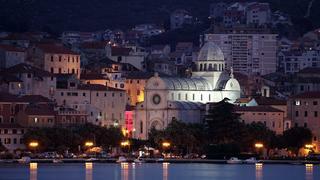 Head for Zadar, past the long, thin island of Pag, also known for its cheese, lace and party scene. Moor your superyacht in the outer part of Marina Zadar Tankerkomerc and enjoy the city. Wander around the museums, check out the boutiques and absorb the ambience and history. Watch the sunset that Alfred Hitchcock adored while dining in old-fashioned style at Fosa. Then take a gentle stroll around the old town peninsula to appreciate the spectacle of the Greeting to the Sun, accompanied by the haunting notes of the Sea Organ. For cocktails and a live performance, settle down in The Arsenal before finding one of the traditional rowing boats (barkarioli) to ferry you back over the bay. Head for Zadar, past the long, thin island of Pag, also known for its cheese, lace and party scene. 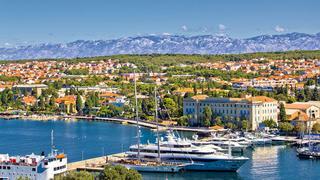 Moor your superyacht in the outer part of Marina Zadar Tankerkomerc and enjoy the city. Wander around the museums, check out the boutiques and absorb the ambience and history. Watch the sunset that Alfred Hitchcock adored while dining in old-fashioned style at Fosa. Drink in the stillness and wild beauty of the Kornati islands as you make an early start for Šibenik and Krka. For an unforgettable rustic lunch, drop the superyacht anchor between Ravni Zakan and Kameni Zakan and take the dinghy to Konoba Larus on Ravni Zakan. Back on your luxury yacht as you sail past the unspoiled islands of the Šibenik archipelago and head up the Krka estuary, there’s the chance to admire the cathedral and fortresses of Šibenik, as you pass on the way to Skradin. Drink in the stillness and wild beauty of the Kornati islands as you make an early start for Šibenik and Krka. For an unforgettable rustic lunch, drop the superyacht anchor between Ravni Zakan and Kameni Zakan and take the dinghy to Konoba Larus on Ravni Zakan. Back on your luxury yacht as you sail past the unspoiled islands of the Šibenik archipelago and head up the Krka estuary, there’s the chance to admire the cathedral and fortresses of Šibenik, as you pass on the way to Skradin. 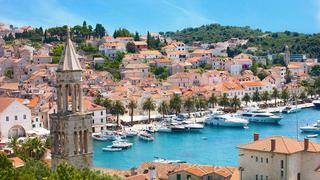 Head for Hvar town and moor your superyacht in the bay amid the bustle and charms of this historic city. Make your reservation at Carpe Diem and spend the rest of the day exploring. Perhaps enjoy the magnificent spa facilities of Suncani Hvar, one of the best luxury spas in the area, before you get ready for a night on the town, or call Hotel Amfora and they’ll come and pick you up so you can chill out on the private beach. Dine locally and then enjoy the best of what’s hot and happening into the small hours at Carpe Diem. Dubrovnik is one of the best-preserved ancient cities in the Mediterranean. You can anchor northeast of the island for great views of Dubrovnik city by night, or moor in the busy port of Gruz, or head up the river Dubravka and moor your yacht at the pier of Dubrovnik ACI Marina to enjoy the charm of the lovely old buildings and gardens. Walk Dubrovnik’s city walls, take in all the stories they have to tell, and then relax and admire more views over a sumptuous meal at Atlas Club Nautika, considered by some to be amongst the world’s most romantic restaurants. 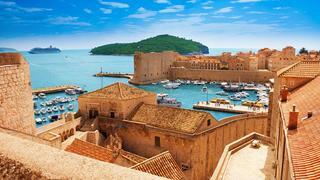 Dubrovnik is one of the best-preserved ancient cities in the Mediterranean. You can anchor northeast of the island for great views of Dubrovnik city by night, or moor in the busy port of Gruz, or head up the river Dubravka and moor your yacht at the pier of Dubrovnik ACI Marina to enjoy the charm of the lovely old buildings and gardens. Walk Dubrovnik’s city walls, take in all the stories they have to tell, and then relax and admire more views over a sumptuous meal at Atlas Club Nautika, considered by some to be amongst the world’s most romantic restaurants. Heading south from Dubrovnik on the superyacht, you pass the short coastline of Bosnia Herzegovina before reaching Montenegro. One of the must-see destinations is Boka Kotorska (the Bay of Kotor), frequently referred to as the Mediterranean’s only fjord. Its steeply rising mountains watch over the ancient towns beneath them and superyacht heaven Porto Montenegro make it a must-visit destination.